A local gospel band comprised entirely of military members is set to begin shooting its first video. The group, At One, is looking for people who are interested in taking part. Read More! The 48th annual “All-Island Eisa Festival” will take place in Okinawa City this weekend, with Orion Beer’s Festival offering relief to the thirsty. 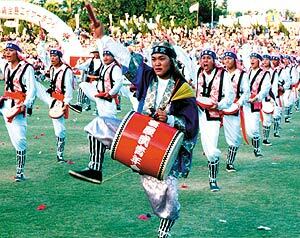 The Eisa Festival kicks of at the Baseball Stadium at the Koza Athletic Park. Read More! The Department of Defense Dependents Schools (DoDDS), Pacific Transportation Management Office (PACTMO) does everything within its power to ensure the safe transport of your children to and from school. In order to provide this service we choose the best possible drivers and equipment within accessible resources and incorporate the most comprehensive training available. Read More! The Southeast Botanical Gardens is currently presenting an exotic eco-entertainment and education program called "Seven Big Bangs" featuring attractions that will provide a perfect summer experience for you and your children. The Wonderland of World Insects showcases the world's largest beetle, the Hercules beetle, along with rare insects from all over the globe including the world's strongest beetle, the Caucasus beetle. Read More!